With all the complexities of the U.S. health care system, people consuming health care services continue to find it challenging to navigate. That’s why, for the fifth year, Aon Hewitt is pleased to partner with the National Business Group on Health (The Business Group) and The Futures Company to conduct the Consumer Health Mindset Study. The study explores the health attitudes, motivators, and preferences of consumers across the U.S.— particularly employees and their dependents as they interact with their employer-sponsored health plans, wellness programs, and the broader health landscape. 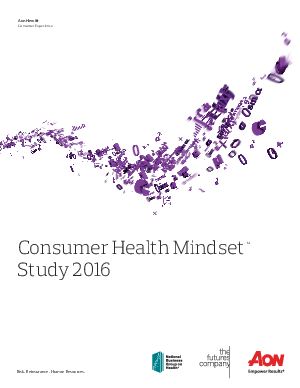 Along with our findings about the consumer health mindset, we recommend practical actions you can take to meet consumers where they are and guide them in navigating health care more effectively.